What is your one true purpose for being here? Beyond the desires of ego? Beyond the expectations of others? Internationally renowned author and speaker, Dr. Wayne Dyer, shares his wisdom and guidance as we contemplate life’s biggest questions. You can free yourself, now and forever, from the chains of ego-dominated, self-sabotaging thinking. Change your perception of your being, and come to feel, know, and rely on your divinely-connected self. 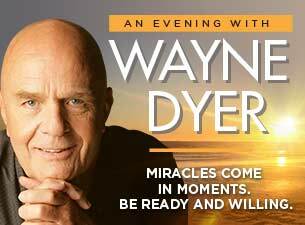 His first visit to New Zealand in over 30 years, Dr. Wayne Dyer is affectionately called the "father of motivation" by his fans. Despite his childhood spent in orphanages and foster homes, Dr. Dyer has overcome many obstacles to make his dreams come true. Today he spends much of his time showing others how to do the same. Don’t miss this intimate and life changing evening.